Since I’m a film dork, my app reviews are of course, on film related apps. 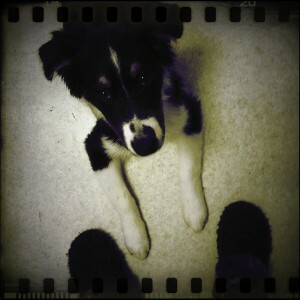 Pocket Light Meter and Lo-mob are two good ones. 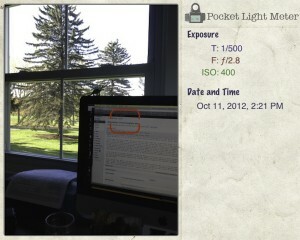 The Pocket Light Meter app is awesome. I love my light meter (a Gossen Digisix) but sometimes if I’ve already got my phone out, or want to make a record of what I shot, I use the Light Meter app. Basically, you hold it up like you would to take a photo, and it shows you your image. Below the image is your shutter speed, aperture, and ISO. As you change one, the others change to compensate and give you a well metered image (as shown in the first image below). You can hit save to take a snapshot, complete with the meter reading, so that you have a record of what your settings were later on when you get the film back (as shown in the second image below). You can hit hold to lock the exposure and image where it is, and then adjust the settings below to see how a different aperture, shutter speed, or ISO would change things. The only thing I wish it had, or maybe I have not yet figured out that it does this, is more manual control. If I want a preview of what the shot will look like if I under or over expose it, it can be difficult to control that. Like any light meter, it is trying to give you the optimal middle ground reading. What you can do to sort of get around this is tap the screen in a spot that you want it to meter for in the image, which can end up under or over exposing, but it can be tricky. If you go into the settings, it does show an exposure correction, but that doesn’t change the way it looks on the screen. It just changes what the meter reading will be for you in the end in case you know you always like to over or under expose your shots. Me, I’d like a preview, but I guess that is something you can always do with your dSLR. If you are like me though, you left that at home, and hence that is why you are relying on the light meter! You can sort of play with “hold” to do it, because when you lift your phone to view the image, it scrolls from light to dark as it adjusts to the right middle ground. If you hit hold before it settles, it will at least show you what the reading would be to overexpose your image. 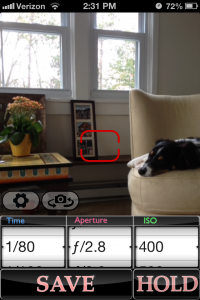 In the settings you can also adjust the shutter, aperture, and ISO stops to full stops, halves, or thirds. The best part about this app? It’s free! And for just $1 you can get rid of the ads, otherwise it is a free app. Cheekily, they also include the option to “buy developer a pint” for $4.99. After writing this review, and realizing how much I enjoy this app, I did just that! I’m a sucker for the cleverness, and always love to buy a pal a pint! Ah, those pesky ads are gone! 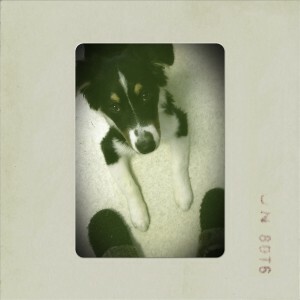 Lo-mob I use less often. 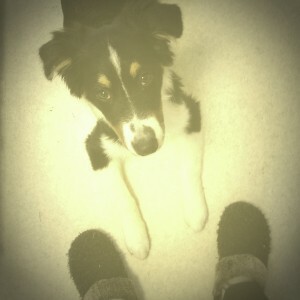 Really, it just applies cool retro filters after you take the shot. So it’s like post-hipstamatic. The filters are things like “Classic Vintage,” “35mm film experimentation (sprocket hole look, etc),” slides, ttv’s (the look of taking the photo through the viewfinder of the camera), emulsions, and polaroid frames and looks. You can adjust the intensity of the effect by turning the vignette and/or frame on or off, you can pan and zoom in the image, add a blur (in some of the filter options) and even adjust the whether or not to include the filter’s effect on color. It is fun if you are into that film look, as silly as it may seem to some to slap an “old look” onto a digital photo to create fake nostalgia. But that’s a debate for another day, non? Here are some examples below of what this app can do, and there are many other filters with which to play! Do any of you use these apps? What else can you tell us about them? 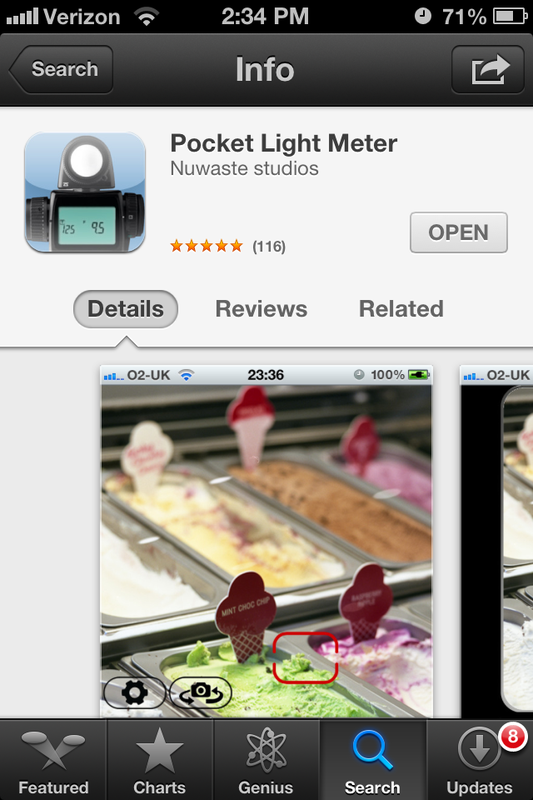 That light meter app has been sitting on my iPhone for the longest time not being used. I am totally inspired by your review to dig it out and give it a try as I am sure it will help my understanding of ISO and shutter speeds. Thank you! 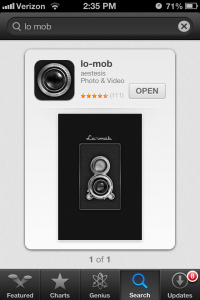 Argh – lo-mob seems another app on the list of why to envy you iPhone users 🙂 Guess I have to write a list soon of why I love my Android! Jenny, do. I don’t have either, and I can’t really justify the cost of an iphone but might manage an android device. I’d love a review of an android pocket meter, too. I’m actually looking for a used ipod on ebay just for the pocket meter but could be persuaded to go the android direction. i’ve been using the pocket light meter app for a couple months, ever since i got my hassy. the app is always dead-on accurate with my dslr’s meter. also, the app was developed by a fellow flickr user, who has been very responsive to user feedback about the app (http://bit.ly/S9mxVd). so it truly is an app by a photographer for photographers. very cool, camille. thanks for the info! I love pocket light meter, been using it ever since Debbie recommended it to me. Never tried Lo-mob, gonna check it out! 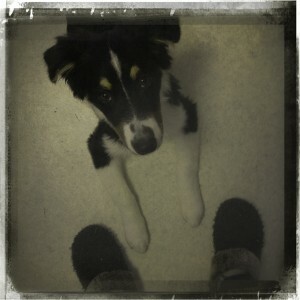 I have used Lo-Mob, it has some pretty sweet filters. 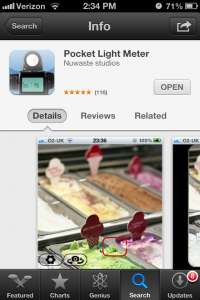 Now I shall try the light meter, so handy as I always have my phone with me.